There may be no better place on the planet to generate solar electricity than Arizona. 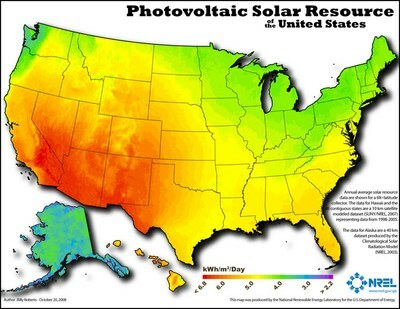 The entire state shows up as a big red stain on those solar radiation maps, and there are plenty of places to put solar panels, from fallow alfalfa fields to parking lots and canals, where photovoltaic arrays can generate power and provide shade from the brutal sun. And then there are all those rooftops, nearly three million in the state, that are just begging to be adorned with miniature solar power plants. It’s all added up to put Arizona in second place in the nation for installed solar capacity -- 1079 megawatts and growing, according to the Solar Energy Industries Association. Many of those megawatts are generated with small, rooftop systems. Arizona Public Service, the state’s biggest utility, says 24,000 of its customers have rooftop solar, thanks both to direct cash incentives for installing solar, and to the state’s net metering program, which requires APS to pay customers for power generated by residential renewable systems. Now, perhaps emboldened by the recent Republican takeover of the Arizona Corporation Commission -- the body that regulates net metering and renewable portfolio standards -- APS has launched an effort to destroy or diminish net metering, saying it costs non-solar ratepayers too much. Predictably, the move has angered renewable energy advocates and Arizona’s burgeoning solar industry. But the utility may not have anticipated the strong backlash from prominent Republicans, which will put the ACC in a tight spot when it has to make a ruling on the proposal. Net metering is when a utility charges the customer for the amount of electricity she uses, minus the amount of electricity generated by his rooftop or backyard solar panel, wind turbine or whatnot. On a sunny afternoon, when no one is home using power, the meter will actually run backwards, with that excess solar power going back into the big bucket of the grid. After the sun sets, and the customer cranks up the air-conditioner and the lights, her meter runs forward again. At the end of the month, if a customer has generated more than she used, the excess rolls over to the following month; a yearly surplus will net her a check. In other words, each rooftop panel is like a little power plant from which APS is buying power. Except that it’s not. For APS the rub [pdf] lies in the fact that it pays the rooftop solar producer the same retail rate -- that includes charges for transmission and infrastructure -- that the customer pays APS, as opposed to the wholesale rate APS pays other power producers. The result is that the solar-generating customer ends up not paying her share of the infrastructure costs. Those costs, in turn, get passed on to other customers. That adds up, wrote APS CEO Don Brandt in an op-ed in the Arizona Republic, where he claimed that net metering ends up costing the average non-solar-generating APS customer some $20,000 over a lifetime. APS is expected to make a formal proposal of some sort -- it will most likely ask that it pay something like wholesale rate to individual solar producers -- at the end of May. The Arizona Corporation Commission will make the final call. In November, voters elected an all-Republican commission, sending candidates who were thought to be sympathetic to renewables packing. In January, the commission reduced residential solar incentives and nixed commercial incentives for Tucson Electric Power’s service area. APS, it seems, will have an easy go of diminishing net metering. Or maybe not. The solar industry -- including companies based in Arizona -- is rallying the troops, claiming that the death of net metering would deal a huge blow to business. Direct cash incentives for rooftop solar installations have dropped almost to zero, leaving net metering as the only real monetary incentive for an Arizona homeowner to pay for a solar system. Other grassroots groups have joined in the fight, as well, including an unexpected one: TUSK, or Tell Utilities Solar won’t be Killed, led by former Congressman and Republic icon Barry Goldwater, Jr. (not to be confused with the Goldwater Institute, founded by Goldwater’s uncle, which wants to get rid of all solar incentives and the renewable portfolio standard). Goldwater argues that by encouraging more rooftop solar, net metering promotes competition (essentially against the “utility monopolies”), which keeps prices down. He also sees developing solar as a means to achieving energy independence. With Goldwater and friends in the ring, APS is likely to face a much tougher fight. It might want to reconsider. After all, each new rooftop solar panel takes a little nibble out of the need to build another utility-scale solar plant -- and the associated transmission -- to comply with Arizona's requirement that at least 15 percent of APS's electricity come from renewable sources. That potentially saves APS and its customers money (though it also takes away an opportunity to make more money, which may be the real rub here). Or perhaps APS could just forget about passing off those extra costs to their customers and just, well, eat them. It certainly can afford it: Last year’s operating income [pdf] was a mere $605 million. Jonathan Thompson is a senior editor at High Country News. His Twitter handle is @jonnypeace.